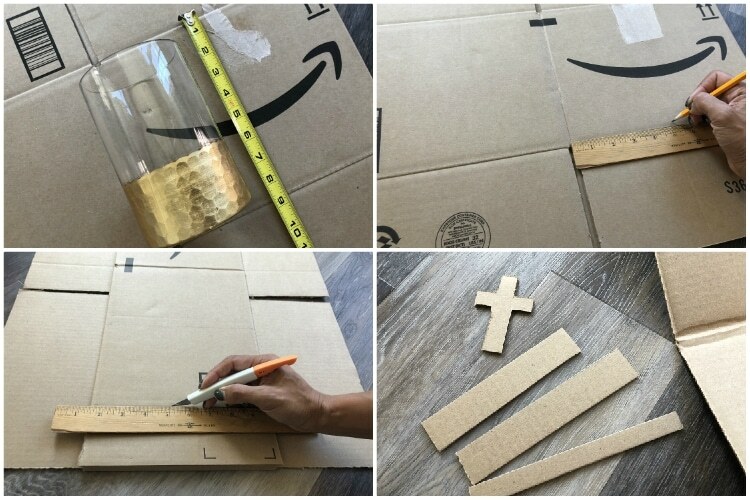 This article, Cardboard Halloween Tombstone DIY, is sponsored by Amazon Prime. All opinions are 100% my own. We’re all about Amazon Prime around here and upcycling my Amazon smile boxes in a creative way is one of my favorite crafts to do with my daughters. Recently, we jumped in on the #boxtumes craze to make a DIY Fortune Teller Booth costume for Halloween using Amazon smile boxes and crafting supplies around the house. This time, we thought we would make a creepy, cool tombstone decoration for an upcoming party. 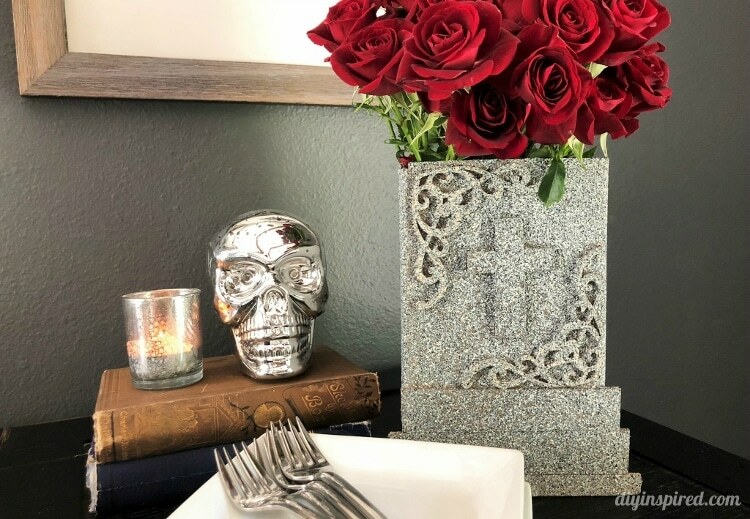 This simple DIY is not only inexpensive and fun to make, but adds a little extra Halloween spooky elegance to your tabletop. The measurements of the cuts will depend on the vase you choose. 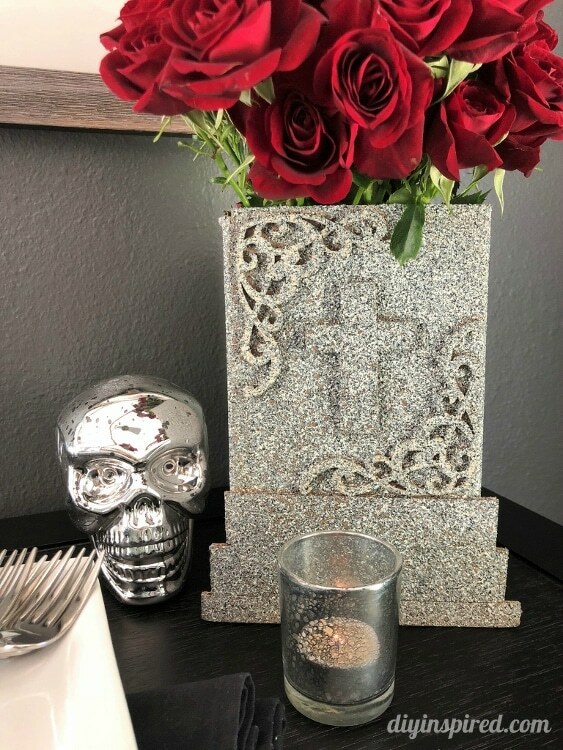 The idea is to have the tombstone slip easily over the vase and hide it completely. In this tutorial, my measurement is 5” X 8”. Use the fold in the Amazon smile box as one of the guides for two sections. Once you have the desired size of your tombstone, mark and measure four equal side by side sections. Cut out the outer edge using a craft knife and straight edge. Use a scoring knife or wooden BBQ skewer to score the lines where the folds should be. Fold the box and glue the two ends together with hot glue. Make your own embellishments with leftover cardboard. The possibilities are endless. Look up images online as inspiration. If desired, use wooden cut-outs to add extra detail. 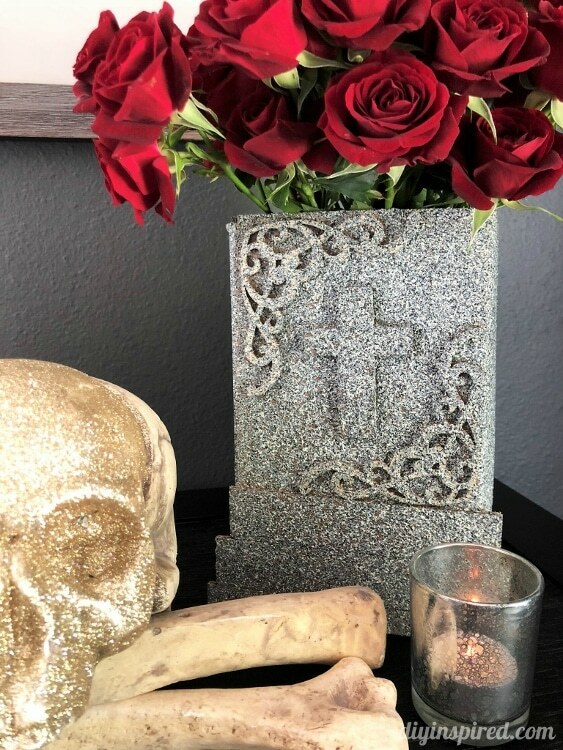 Lastly, spray paint the tombstone with textured stone spray paint. Allow it to dry for an hour or longer. Keep in mind that the dry time for cardboard will be longer than indicated on the can instructions. Once the tombstone is dry, slip it over a water filled vase and arrange a bouquet of flowers. To make it extra creepy, add a few cobwebs and plastic spiders. These can be made in many different shapes and sizes. 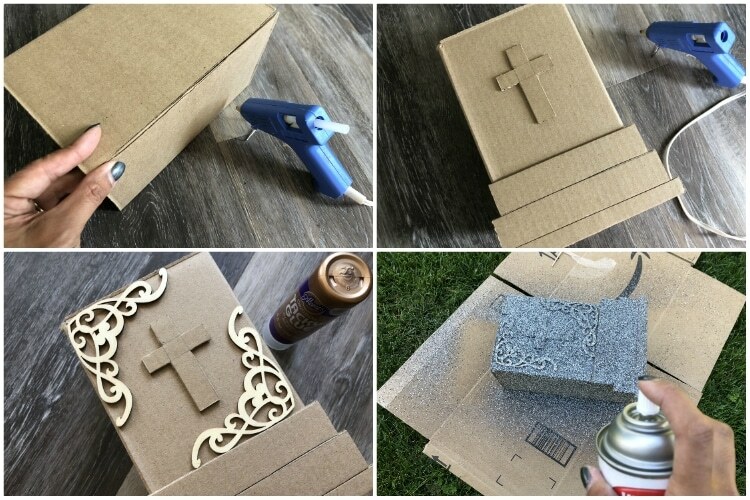 One can of stone textured spray paint should paint three or four small tombstones. Are you up to the challenge? Show off your creativity by upcycling your #AmazonPrime smile boxes into #morethanabox with #boxtumes or home décor this Halloween!